As part of a new monthly feature sponsored by PowerBar (www.powerbar.co.uk), Tri247 welcomes you to the Powercoach Zone. This month, coach Joe Beer (www.JBST.com), shows us how to optimise your nutrition for those early season races. Training and diet must be linked for optimal results. A synergy of what you consume and your physical output. However, don't be bamboozled by the marketing hype, be very clear on this - training is a much stronger way to get to the finish line faster. Nutrition enhances the benefits of training and racing (like adding an aero helmet on race day), but it does not do the training or racing for you. If you remember one thing, make it this: training is a very potent stimulus to getting better. There are no short cuts, no miracle drinks, bikes that power themselves or wetsuits that have a sense of direction in open water. Bottom line is that your race results are a product of your training volume, consistency, session intensity (such as endurance work or interval hills), skill level, equipment use and diet. Top athletes train many hours, have good genetic make up, top equipment and total life focus on their athletic goals. Its not down to a drink, gel and supplement why they win an Ironman or break a world record. If it could be done in five hard one-hour sessions a week and a super berry juice drink sitting on the sofa for the rest of the day they would already being doing it. From Roger Bannister's track reps in the build up to breaking the four-minute mile to Luc van Lierde's awesome swim-bike-run efforts prior to the World Ironman Record, it was training not nutrients that got them there. Nutrition use in sport still has a long way to go to be optimised by many. I know marathon winners who never drank a drop throughout their elite performances, old pro riders who profess that "you don’t need carb drinks or gels if you are on a good diet" (whatever that might be?) and age group triers who think the goal is to see who can train on the least food. The one with the oldest unused gel in their pocket wins. Really? Winter training in the build phase demands more of you, your energy pathways (like glycogen turnover rates) and, as the season is closer, body mass (specifically fat levels) need to be honed in to be in shape for peak races. With higher fitness comes higher carbohydrate demands. Fasted workouts can aid fat use and efficiency of their storage but not when you want to do work above 80%HRmax (aka tempo, Z2, threshold, name it what you will). Lack of carbs will reduce quality work you can do and slow recovery from harder, longer or higher volume days. Whilst training in a low carb status may cause slight increases in aerobic fitness its hard on those who have to work or be sociable after training. Conversely over doing the "high carb" ethos puts on fat mass and makes athletes less efficient at fat use. Becoming chronically fatigued due to insufficient carb intake over many days is not what training is trying to achieve. Do don't try to lose too much weight if your early events are coming thick and fast. Harder training, less treats and more focus on your weight (see next tip) should do the trick without drastic measures that make training energy close to non-existent. * COACHES TIP: carb loading (before a race or during recovery days) makes tired legs swell and veins disappear and the athletes mass goes up showing carbs and water are being stored. 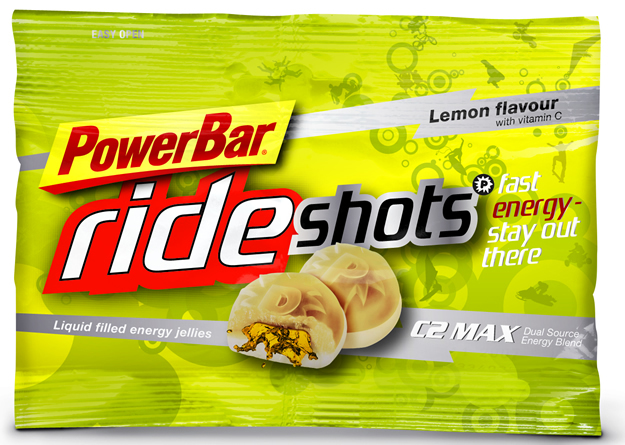 PowerBar Ride Shots contain nine bite size pieces in a resealable bag. They contain the patented C2Max duel source carb blend and are a great way to control energy intake as each piece is 22 kcal. A full bag is the equivalent to 1.8 PowerBar gels and over double the calories of some other brands! So at rrp £1.80 they are really great value. Cola flavour contains 75mg caffeine per bag! 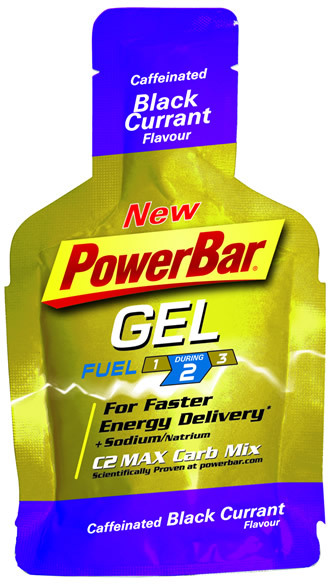 PowerBar Gel is a great way to carry a concentrate of carbs and electrolyte. Each 41g sachet packs in 109kcal of C2Max duel source carb blend and a whopping 210mg of sodium the key electrolyte for hydration. Available in 6 flavours two of which have 50mg caffeine, all including the caffeinated have a rrp of £1.25. Tip - Next time your shopping for a gel check the calories and the caffeine volume and see which come out the best value for money. Many gels out there taste weaker and are a larger packet but pack no electrolytes and deliver far less energy. Yes over winter some chubb generally increases in most athletes, even the pro’s. Granted they don’t become obese and try to get sub 10-percent fat in six months but winter is a time to be a bit more liberal with your diet. But, we're not in winter its close to the clocks changing and you need to get real right now. Right now! What gets measured gets done, that is measure your weight don't guess it or pretend it will miraculously hit the right zone by your big events by accident. For some weight is not an issue of losing fat but maintaining hydration levels. Thus regular weigh in's after sessions can help to see what amount of liquid is lost from longer sessions or indoor exertions. * COACHES TIP: graph your weight on your fridge for all to see. If it is not shifting every 2-3 weeks its time to trim a few more calories and find an extra hour or two a week for training. How many times a week do you treat yourself? Have you fallen into bad habits? Slipped down the chocolate treat slope into a haven of treats galore? Don't be a monk but also don't train well then undo all the good with really poor nutrition. Five portions of fruit and veg, good hydration, quality lean protein sources and the rest of the dietary mantra's we have been told also leaves some scope for a small portion of treats from time to time. Have the odd treat but don't try to fuel your training and racing on them. If you get stuck, do a weekly 2-3 day diet diary to keep yourself in check. * COACHES TIP: don't buy what you don't want to have screaming at you from the fridge, larder, office desk or glove compartment. Oh and never go shopping straight after a hard or long session – you will buy poor quality nutrition (probably). This can give you insights into trying something different but also seeing how you respond to something new without putting a big event on the line. Aero bottle rattling? Caffeine intake give you a bit too much of a buzz that evening? Need to pack some bars in the glove compartment so I don’t get caught hungry next time? The list goes on. Swim smooth, bike safe and run light. JB.